Hope you all had a fantastic summer and enjoyed your holidays. I checked your blogs and could see that some of you travelled around the world and visited really wonderful places like Greece, Rome, Paris...lucky you! Those who follow me on Instagram already know how I love carrot cake and (I shouldn't say that for the sake of my reputation but whatever!) how often I like to enjoy a piece of this cake or a carrot cupcake from my favorite vegan bakery in the whole wide world: Lujuria Vegana (in english 'Vegan Lust'). 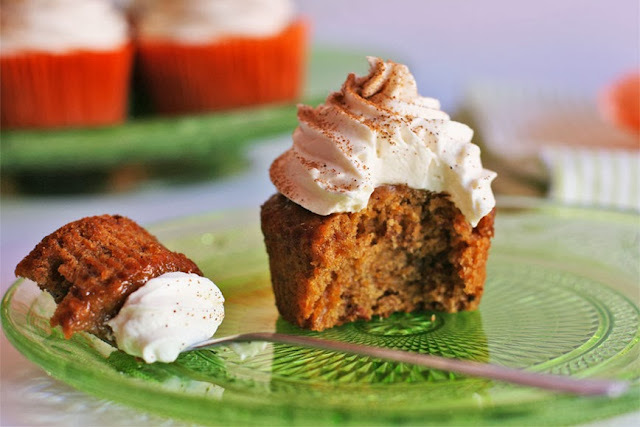 Wether you are or are not vegan the carrot cake and, sincerelly, any cake, cookie or pastry that comes out of their ovens, that vegan chef Toni Rodríguez creates will send your taste buds into pure bliss. I kid you not when I say that their carrot cake is the best vegan dessert one can ever taste, and when they say it's their best-seller it doesn't surprise me cause their cakes could conquer anyone's heart. 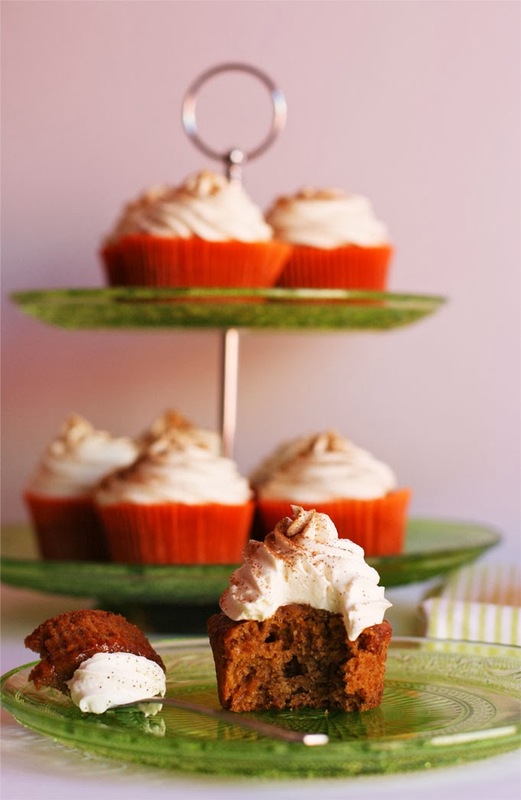 These carrot and raisins cupcakes from Toni Rodríguez's latest cookbook "Cupcakes Veganos", they are spicy, moist, tender, so very delicious and sweet! I'm so happy with how they came out, I was a bit afraid cause it was the very first time I tried out this recipe but....two thumbs up for me! Hehe. I frosted these cuties with the cream cheese frosting (also vegan, obviously) from the same book. I would loved it to be a tad bit more thick to get a perfect piping but sooner or later I will find the perfect vegan frosting (read 'the one that chef Toni makes'): not much sweet, thick enough, not too buttery and with a perfect blend of cream and cheese. 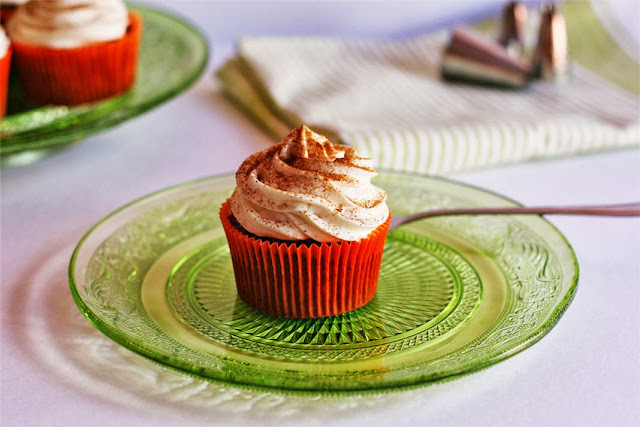 Recipe from the book "Cupcakes Veganos" by Toni Rodríguez. In a large mixing bowl mix all dry ingredients (flour, sugar, baking soda, salt, baking powder and cinnamon). Grate carrots and squeeze them to gently drain off excess liquid (very important step!). In a medium saucepan pour the raisins and boil for 10 minutes. Strain out the raisins and blend well. Add in water, oil, carrots and blended raisins. Mix until smooth. Fill the liners two thirds full. Bake for 28 minutes or until a toothpick inserted through the center of one cupcake comes out clean. Set aside and let cool completely for, at least, 2 hours before using the frosting. In a mixing bowl cream together margarine (softened) and confectioners' sugar until well combined and lumps-free. Add in cream cheese and mix well using a handheld mixer until smooth and creamy. Keep tightly covered and refrigerated until ready to use. Once fully cooled, frost the cupcakes with the vegan cream cheese frosting and decorate with a bit of ground cinnamon. 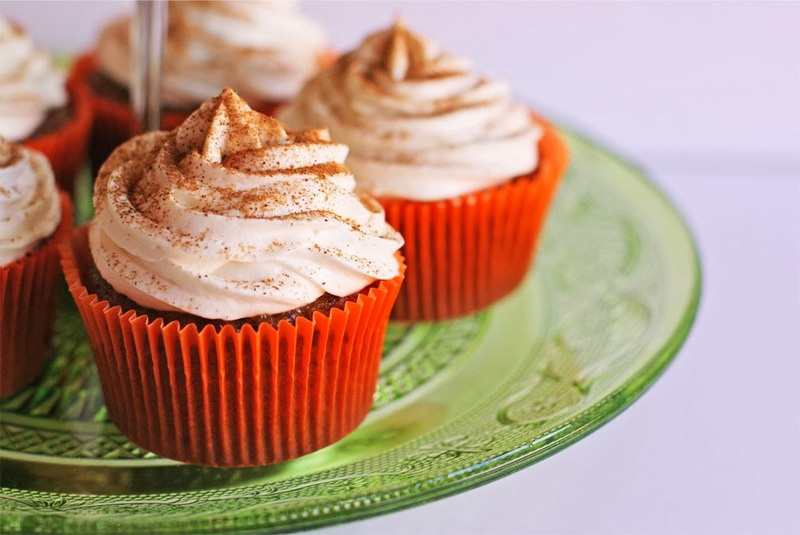 Keep your frosted cupcakes refrigerated until serving. Mooolt de temps, un llarg descans estival, ja ho pots ben dir, però segur que merescut! Al final, després de tanta recepta amb pastanaga, m'hauré d'animar a fer-ne alguna, perquè aquests cupcakes fan una pinta deliciosa! La veritat és que sí, he estat un llarg temps de vacances...jeje. 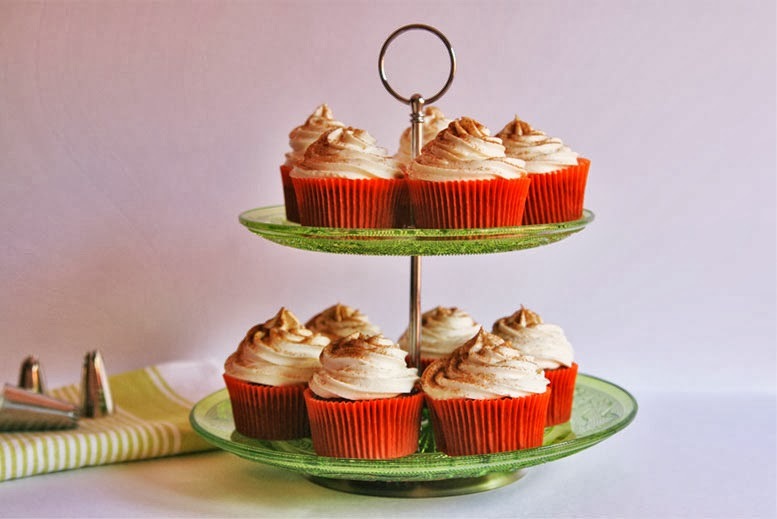 Love your blog, and this recipe! Your vegan cream cheese frosting looks delicious and seems like it holds its shape pretty well! Do you have any tips for making a vegan cream cheese without it being curdle and/ or runny? I haven't had any success with any vegan cream cheese frosting that didn't result in a runny texture! Thanks for your feedback! Well, first of all, the vegan cream cheese is one I use to buy at a vegan and organic products shop. I know there are people that make their own vegan cheese at home using tofu, nuts, water...etc. But I'm not that confident so when it comes to make frosting I usually buy a vegan cream cheese from the brand 'Tofutti'...not sure if it's available in your area (I'm from Spain). If you live in the States there's a famous brand called Earth Balance that makes a huge variety of vegan products. And now some tips to make a vegan cream cheese FROSTING: use a margarine with zero hydrogenated fats and make sure both margarine and cream cheese are very cold. As well as the vegan whip (whipping cream). I recommend you to keep your vegan whip refrigerated for at least 24 hours and if you can find one that has zero hydrogenated fats it will be perfect! There are lots of whipping creams that, even though they are vegan, they are not healthy at all. Unfortunately, the ones I find here in Spain have a small amount of said fats but owell...I will keep on searching. Even though this frosting came out pretty good, thick and good for piping, I'm still trying new recipes and looking for the perfect vegan frosting: one that is not too soft, thick enough to use whatever piping tip I want and that holds the shape even at warm temperatures. I'm sure one of the 'secrets' for getting a thick frosting is the shortening but, again, I can't find one without hydrogenated fats...and I will NEVER use Crisco's shortening because it's like commiting suicide...Crisco shortening is like poison, TOO much fat for my veins. Hope my reply helped you!